Besides widgets, everything on the Droid Bionic Home screen is a shortcut. The app icons? Shortcuts. But the variety of shortcuts doesn’t end with apps. You can add shortcuts to the Home screen that help you get at a phone feature or display an informational tidbit without digging deep in the phone. That’s why they’re called shortcuts. For example, you can have a shortcut on your Home screen that uses the Maps app Navigation feature to help you return to your house from any location. 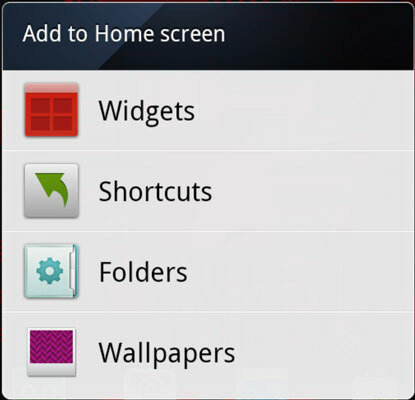 To add a shortcut, long-press the Home screen and choose the Shortcuts command from the Add to Home Screen menu (refer to the figure). What happens next depends on which shortcut you choose. For example, when you choose Bookmark from the Select Shortcut menu, you add a web page bookmark to the Home screen. Touch the shortcut to open the Browser app and visit that web page. Choose the Contact shortcut to display contact information for a specific person. The Droid Bionic has shortcuts for Music and the Maps app (Direction & Navigation); plus, shortcuts for various apps are installed on your phone and also shortcuts to common phone settings such as battery use and, Wi-Fi.